Cherry Creek is an experts only run rated Class V+. With an overall gradient of 110 feet per mile and a "Miracle Mile" dropping at over 200 feet per mile, Cherry Creek is possibly the most challenging whitewater rafting run in the nation. Once the winter snowpack has finished melting and spring rivers run short on water, river flows suitable for whitewater rafting allow Cherry Creek to run as late as October. 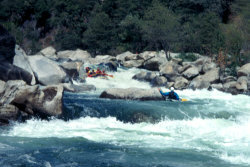 Whitewater rafting permits and camping are available through the Stanislaus National Forest Service. The mile-by-mile & river descriptions found in this website cannot replace the judgment and skills required to guide this river. The shuttles and access directions are fairly easy but the shuttle is long and slow going. Put-In: Cherry Creek just below the bridge.